"It's easy to call Facebook the social network of the past. It's harder to build the social network of the future. To hear Bradley Horowitz tell it, though, Google is well on its way. Google+, he says, lets people share with others in a more natural way than its competitors. Easy privacy controls, an environment free from obtrusive advertising, and highly polished mobile apps combine on Google+ to deliver a next-generation social network, as Horowitz tells it." In 2012, AWS will launch 158 new services and features, up from 81 in 2011. And AWS in 2012 now adds enough server capacity to power a $5 billion global enterprise daily." "Some people are trying the new Internet Explorer and actually liking it. Not that they would say that out loud. Curious? It's a new browser." "Working this time with Samsung, the Nexus 10 is a good alternative to the iPad. I’ve been using it for the past week, and I love the gorgeous display and design. The latest Android software also brings some nice extras, such as enhanced voice search and support for multiple users. Plus, it’s $100 less than the latest iPad, at $399 for the 16 gigabyte Wi-Fi model and $499 for the 32GB Wi-Fi version." "Would you like to programmatically publish some web content? Or let your users do so in the context of your Drive app? "Autonomy was audited by the British arm of Deloitte. H.P., which is audited by Ernst & Young, hired KPMG to perform due diligence in connection with the acquisition — due diligence that presumably found no big problems with the books. That covered three of the four big firms, so it should be no surprise that the final one, PricewaterhouseCoopers, was brought in to conduct a forensic investigation after an unnamed whistle-blower told H.P. that the books were not kosher. H.P. says the PWC investigation found “serious accounting improprieties, misrepresentation and disclosure failures.”"
"It’s also a perfect computer for the technophobic. It’s very hard to get lost in an operating system that basically has no features. It’s been a long, patient slot for Google to get here, but with year after year of careful tweaks and improvements — and a jaw-dropping $250 price — the Chromebook is finally ready for prime time." "It's not exactly news that Facebook continues its epic reign among social media sites - but it's still surprising just how much it dominates. According to data cobbled together in a new infographic from San Francisco law firm Morrison & Foerster's Socially Aware Blog, each month, visitors spend an average of 6.75 hours on Facebook. At first gloss, that may not sound like much, but that's almost double the amount of time users spend with Tumblr, Pinterest, Twitter, LinkedIn and Google+ - combined. " "The fact that Jassy's presentation says that the Redshift service also uses PostgreSQL drives to link to third party BI tools would seem to indicate that Amazon has parallelized the open source PostgreSQL database, much as EMC's Greenplum and IBM's Netezza have done for their data warehousing appliances. While the base open source PostgreSQL database does not support columnar storage, Yahoo! whipped up a columnar variant of PostgreSQL and out it into production more than five years ago, and if Yahoo! can do it, Amazon can, too." "Things got even worse when many Windows 8 reviews said the learning curve was “steep.” And when Windows boss Steven Sinofsky stepped down from his post, some wondered if the wheels were falling off Microsoft’s OS train. And yet, the actual raw figures seem to indicate things are actually going pretty well. So, why is there such a discrepancy in the earlier reports and Microsoft’s own data? Perhaps Windows 8 reviews really didn’t matter as much as the pundits expected. And despite several fan sites on the Web touting Windows 8’s virtues, there appears to be a growing contingent of people that like to believe that Microsoft, the once-dominant giant, is crumbling." "Much of this will be a relic within a few years, according to Mr. Hawkins. “Hadoop won’t go away, but it will manage a lot less stuff,” he said in an interview at Numenta’s headquarters in Redwood City, Calif. “Querying databases won’t matter as much, as people worry instead about millions of streams of real-time data.” In a sensor-rich world of data feeds, he is saying, we will model ourselves more closely on the constant change that is the real world. Mr. Hawkins thinks that the human neocortex, that part of the brain that includes the perception and reasoning functions, itself works as a kind of pattern-seeking and predictive system. Brain cells, starting at some of their most elemental components, work together to build expectations, initially about things like light and dark, or near and far, that they gather from sensory organs." "HP does have pretty ample cash reserves, and Moody’s even says as much in its announcement: $11.3 billion in cash and equivalents as of the end of the most recent quarter, and it said it expects that level to remain north of $8 billion for the forseeable future. Add to that an expected $4 billion in free cash flow in 2013, and it makes it unlikely that HP will need to borrow anytime soon." "In its current form, Hewlett-Packard is a wasting asset, whose value to customers, employees and shareholders is steadily declining. It is time for the board to move quickly to restore its former status as a company everyone can admire, one that can compete successfully in two very different global markets. If it does so, Hewlett-Packard’s beleaguered shareholders will finally benefit from a substantial jump in the combined market valuation of the separate companies." "Today, we are excited to announce the limited preview of Amazon Redshift, a fast and powerful, fully managed, petabyte-scale data warehouse service in the cloud. Amazon Redshift enables customers to obtain dramatically increased query performance when analyzing datasets ranging in size from hundreds of gigabytes to a petabyte or more, using the same SQL-based business intelligence tools they use today. Customers have been asking us for a data warehouse service for some time now and we’re excited to be able to deliver this to them." "Users don't have to do anything to take advantage of this new feature. When you attach a file, Gmail will double-check that your recipients have permission to view the files in Google Drive. ReadWrite says that if the person you're sending a file to doesn't have permission to view the file, then Gmail willprompt you to change the sharing settings without having to leave your email." "New metrics released today by research outfit Kantar Worldpanel ComTech show that for the 12 weeks ended Oct. 28, iOS accounted for 48.1 percent of U.S. smartphone sales, surpassing Android, which accounted for 46.7 percent. The engine of Apple’s resurgence? The new iPhone 5, which helped the company more than double its share of the U.S. smartphone market year over year, and put it within reach of its all-time high." "Those efforts seem to have brought some relief to Wall Street. Analysts issued more bullish projections for the company in recent days, and the stock was up 49 percent from its lowest point, closing Tuesday at $26.15, although that is still well below the initial offering price of $38. The share price has been buoyed in part by the fact that a wave of insider lockup periods expired without a flood of shares hitting the market." "Perhaps a bigger issue is that OpenText suffers from many of the same underlying diseases as Autonomy. To be sure, OpenText has not been run by a megalomaniac, and I've never heard any hint of financial or stock manipulation at the Canadian ECM vendor. Nonetheless, like Autonomy, OpenText is fundamentally a roll-up company, focused more on buying smaller vendors than developing and integrating those systems into a more coherent whole. This can bring short-term returns, but I believe is a highly suspect long-term strategy for customers. " "Realistically, deep learning is only part of the larger challenge of building intelligent machines. Such techniques lack ways of representing causal relationships (such as between diseases and their symptoms), and are likely to face challenges in acquiring abstract ideas like “sibling” or “identical to.” They have no obvious ways of performing logical inferences, and they are also still a long way from integrating abstract knowledge, such as information about what objects are, what they are for, and how they are typically used. The most powerful A.I. systems, like Watson, the machine that beat humans in “Jeopardy,” use techniques like deep learning as just one element in a very complicated ensemble of techniques, ranging from the statistical technique of Bayesian inference to deductive reasoning." "You are what you link to. Several news organizations earlier today repeated information from a phony press release that circulated after 10 a.m., claiming Google was acquiring a tiny Rhode Island firm, ICOA, that installs public Wi-Fi nodes. The release first circulated on PRWeb, a free service operated by a public relations company called Vocus." "Contextual information provided by mobile devices—via GPS chips and other sensors—can provide clues about a person and his situation, allowing Google to guess what that person wants. “We’ve often said the perfect search engine will provide you with exactly what you need to know at exactly the right moment, potentially without you having to ask for it,” says Wiley. Google is already taking the first steps in this direction. Google Now offers unsolicited directions, weather forecasts, flight updates, and other information when it thinks you need them (see “Google’s Answer to Siri Thinks Ahead”). Google Glass—eyeglass frames with an integrated display (see “You Will Want Google’s Goggles”)—could also provide an opportunity to preëmptively answer questions or provide useful information. “It’s the pinnacle of this hands-free experience, an entirely new class of device,” Wiley says of Google Glass, and he expects his research to help shape this experience." "There’s been a lot of discussion over the past few days about the recent changes to Facebook’s privacy and governance policies — including the revelation that (gasp!) Facebook is not actually a democracy — but one element of the new rules has gotten less attention than it probably should: namely, the fact that the giant social network is going to use the data it has about your likes and dislikes to show you ads outside of Facebook. This is the first real confirmation that the company is going to roll out an advertising network that extends beyond just its own walled garden, and it could turn out to be one of the biggest factors in the success or failure of Facebook’s revenue-growth strategy." "ICOA provides wireless and wired networks in high-traffic public locations in the US, adding WiFi hotspot zones to airports, restaurants, universities, travel plazas, and many other public venues. As part of the deal, Google is set to pick up 1,500 of ICOA’s broadband access installations across 45 US states." "Only days after a report anticipating a surge in tablet shipments, it's official: Tablet display shipments topped laptops in October, said NPD DisplaySearch today. "In a milestone for the global industry, in October tablet PC panel shipments exceeded those of notebook PC panels," NPD DisplaySearch said today in a research note. Because display panel shipments are always the leading indicator for device shipments, "it can be seen that tablet PCs are threatening to overtake notebooks," DisplaySearch said." "The technology, called deep learning, has already been put to use in services like Apple’s Siri virtual personal assistant, which is based on Nuance Communications’ speech recognition service, and in Google’s Street View, which uses machine vision to identify specific addresses. But what is new in recent months is the growing speed and accuracy of deep-learning programs, often called artificial neural networks or just “neural nets” for their resemblance to the neural connections in the brain." "Unfortunately, as a Microsoft product manager told me understatedly, “We have an awareness problem.” Translation: Nobody is buying Windows phones. And since nobody’s buying them, nobody’s writing apps for them. And since nobody’s writing apps — well, you can see where this is going. Still, Microsoft isn’t giving up. This month, Windows Phone 8 arrives aboard two fascinating new phones: the Nokia Lumia 920 ($100 with a new AT&T contract) and the HTC Windows Phone 8X ($200 from AT&T, Verizon or T-Mobile)." “The short version of my argument is this: I believe Autonomy's impressive financial results (at least those reported) served to conceal key warning signs about its aging flagship search technology, doped-up sales strategies, warped internal culture, and growing disdain for its own customers. "It’s the latest in a string of failed high-profile acquisitions by a mismanaged company, but it’s more than that. Autonomy was also supposed to be HP’s big shot at moving into the high-margin software business that’s kept its two biggest competitors — IBM and Oracle — chugging along. But it shouldn’t be a big surprise that the acquisition has proved to be a colossal failure. If HP has proved anything over the past decade, it’s that it doesn’t do software, at least not the sort of enterprise software that big companies pay lots of money for so they can manage their data and corporate assets." "The goodwill figure is especially telling. Goodwill is the bookkeeping entry that a company records when it pays a premium to buy another company. More precisely, it’s the difference between the purchase price and the fair market value of the acquired company’s net assets. Goodwill can’t be sold by itself. The goodwill in this instance tells you that HP paid $6.9 billion more than it believed Autonomy’s net assets were worth. Now HP is writing down some of that goodwill and blaming it on supposed financial-reporting improprieties by Autonomy. This also doesn’t make sense. HP didn’t record the goodwill because it was lied to by Autonomy. HP recorded the goodwill because it knew Autonomy’s identifiable assets were worth much less than it paid." "The week-long trial in a Seattle federal court examined how much of a royalty Microsoft Corp should pay Google Inc for a license to some of Motorola's patents. Google bought Motorola earlier this year for $12.5 billion, partly for its library of communications patents. Motorola had sought up to $4 billion a year for its wireless and video patents, while Microsoft argues its rival deserves just over $1 million a year." Is your mind blown yet? If not, read that list a couple of times and think to yourself, "How much do I spend on gas a month? A year? A decade and in a lifetime?" "
... and also think about the ecological implications, while you're at it. "After Nokia’s Here app was released on Monday, it quickly climbed to the No. 4 spot on Apple’s list of most downloaded apps. By Tuesday afternoon, the app already had 378 reviews in iTunes with an average rating of 2.5 stars. The majority of users rated it one star. Some of the complaints were similar to those that greeted Apple’s map service: some locations are mislabeled, and some information, like street maps for Japan, is missing. Others complained that the maps were ugly and sluggish to load. People who rated the app five stars said the location data was more accurate than Apple’s." “The geocoder is powered by 100% public domain data. We are using Natural Earth for countries and provinces, Flickr Shapefiles for cities, and U.S. Census TIGER for zip codes. We combined these sources into a database of nearly 200,000 places that the MapBox geocoder uses to quickly return accurate results. "If Microsoft wants to be taken seriously by consumers and app developers, it will have to make serious strides with its Windows Phone Store, which for now includes just a fraction of the apps available for Android and iOS. But Microsoft is an old hand when it comes to wooing developers, and Windows 8—its operating system for desktops and tablets—is designed to make it easier for developers to create software components that work on both mobile and conventional computers. So I’m going to bet they can do it, even if it may take some time." "Hewlett-Packard said on Tuesday that it had taken an $8.8 billion accounting charge, after discovering “serious accounting improprieties” and “outright misrepresentations” at Autonomy, a British software maker that it bought for $11.7 billion last year." "Powerbook Medic has torn the Kindle Fire HD 8.9 apart for the world to peer inside. It seems Samsung has done well out of the tablet, as it's supplying—at the very least—the display, RAM, and flash memory. The processor is courtesy of Texas Instruments, though." Kindle Fire HD 8.9 Teardown: A Samsung Tablet By Another Name? "Now, Microsoft is following this up with a new set of challenges under the “Meet Your Match” moniker. According to Microsoft, this is a different take on the “Smoked” challenges. The focus now isn’t just on how Windows Phone 8 on devices like the Lumia 920 allows user to finish tasks faster than on other operating systems, but also on “why it’s better, easier, more useful, and more fun. The soul of Smoked – a side-by-side comparison of us vs. the other guys – hasn’t changed, but now it’s about why our phones and features are a better match for you, no matter who you are or what you’re into.”"
"In general we're quite fond of 7-inch tablets and so, of these two, we'd still take the more portable 7-inch Kindle Fire HD. However, those who need just a bit more workspace, or who can't stand to ever be offline from any location, might want to consider the 8.9. Meanwhile, if you're a more serious tablet user who wants access to the full power of the Android operating system, the decision is still simple: go with something else." "Google took a page from Apple’s playbook when it rolled out its own AirPlay-like remote control feature for YouTube on Google TV last week. The company has since launched a dedicated micro-site to promote the feature, showing how serious it is taking second screen control. But it is not stopping there. Drayson told me that Google is “actively working with other companies” to turn this into an open standard, which could be used on other platforms and for other apps as well. And it’s not just about remote control functionality and beaming a video from your mobile phone to the TV we are talking about. The new protocol makes it possible for data to flow in both directions, Drayson explained, which would enable developers to build second-screen experiences that correspond to what’s happening on live TV as well. Also on the roadmap: beaming content from your laptop to your TV screen." "The App Economy isn't merely delightful, it's also an economic juggernaut that's created more than 400,000 jobs and a multi-billion-dollar business where there was, very recently, nothing. That's the good news. The bad news is that in the App Economy, as in every hit-making business, there is the top 1% and there is everybody else. For a taste of the App Economy's inequality: Of the $6.5 billion that Apple has paid to app developers, only 25% made more than $30,000 and 4% made more than $1 million. " "IBM says it has now accomplished this milestone with its new “TrueNorth” system running on the world’s fastest operating supercomputer, the Lawrence Livermore National Lab (LBNL) Blue Gene/Q Sequoia, using 96 racks (1,572,864 processor cores, 1.5 PB memory, 98,304 MPI processes, and 6,291,456 threads). IBM and LBNL achieved an unprecedented scale of 2.084 billion neurosynaptic cores* containing 53×1010 (530 billion) neurons and 1.37×1014 (100 trillion) synapses running only 1542 times slower than real time." “I have great hopes for Windows 9 on mobile and tablets. Just as Windows 7 was "Vista Done Right," it's quite likely that the touchscreen version of Windows 9 will be "Windows 8 Done Right." The situation is much worse on regular PCs, particularly for knowledge workers doing productivity tasks in the office. This used to be Microsoft's core audience, and it has now thrown the old customer base under the bus by designing an operating system that removes a powerful PC's benefits in order to work better on smaller devices. The underlying problem is the idea of recycling a single software UI for two very different classes of hardware devices. It would have been much better to have two different designs: one for mobile and tablets, and one for the PC. on deploying SAP solutions on AWS, visit http://aws.amazon.com/sap"
"Could the pair do more in terms of sharing among its users? Sure! Could they more tightly integrate services? Yep! Could they do something jointly related to advertising? Why not! But will they build a search engine together? Not likely. Indeed, I am not even sure what such a thing means, since it would now be nearly impossible to execute, given Yahoo has outsourced its core search technology long ago to Microsoft and has been largely focused on improving search experience since then." I suspect the Q4 2012/Q1 2013 numbers will suggest that, for most people not primarily interested in an e-reader tablet (i.e., Kindle or Nook), the tablet decision is coming down to 1) Apple iPad or Google Nexus and 2) ~7" or ~10"
"By keeping its tablet prices so high, he said, Apple could lose its place as the biggest tablet seller, just as it did with smartphones when it lost the first-place position to Samsung, which makes less expensive phones using Google’s Android software. The iPad still dominates the market with a 50 percent share, according to third-quarter figures from the research firm IDC, but that is down from 60 percent a year ago. Samsung is in second place with an 18 percent share, Amazon is third with 9 percent, and Asus, which makes Google’s Nexus 7 tablet, is in fourth with 8.6 percent of the market." ""This is quite a historic moment, the end of an era for an iconic 20th century brand," said Tony Baer, an analyst at Ovum. "IBM's been laying the groundwork for retiring the Lotus name for several years. But don't forget that in its lifetime, Lotus was already reinvented when it went from spreadsheets to 'groupware,' the first real collaborative application—if you're not counting email. Today, collaboration is no longer an app, but a capability that is baked into applications, devices, messaging systems and social networks. Maybe it's not obvious from today's perspective, but Lotus became a victim of its own success."" "One way to find and experiment with data while avoiding politics and addressing resource availability is to create and participate in a big data Petri dish. A case in point is the recently-opened Hack/Reduce, a non-profit in Cambridge, Massachusetts, offering space and computing resources to individuals and organizations interested in developing big data applications. About 100 big data enthusiasts were expected today at the Hack/Reduce kickoff hackathon. Participants were encouraged to BYOD or bring their own data, co-founder Frederic Lalonde told Xconomy’s Gregory T. Huang. “If they work for a company or organization that has a public dataset,” said Lalonde, “the best thing they can do is come in and make that available to the community.”"
"The book, which has a planned publication date of December 4, is packed with powerful portraits of how life is changing in a world filled by a never-ending stream of data -- from constant Facebook updates to signals from our smartphones to new data-driven ways to predict heart-attacks in real time. There's an ongoing data-collecting component of the project as well. Smolan released accompanying mobile apps in September and, with permission, has been recording data of people's lives from around the world that he'll publish in a couple of weeks." "Despite the rumors of hordes of hip programmers starting million-dollar businesses from their kitchen tables, only a small minority of developers actually make a living by creating their own apps, according to surveys and experts. The Grimeses began their venture with high hopes, but their apps, most of them for toddlers, did not come quickly enough or sell fast enough. And programming is not a skill that just anyone can learn. While people already employed in tech jobs have added app writing to their résumés, the profession offers few options to most unemployed, underemployed and discouraged workers." "In this always on, always-connected world, it's increasingly difficult to give up mobile broadband while traveling, even when overseas. The beauty of GSM networks and the SIM card has always been the relative universality of the networks, and the interchangeable nature of SIM cards. Granted, some regions don't use GSM; and to enjoy this flexibility, one needs to have a phone or tablet that's "unlocked"—meaning, not tied to a carrier. Until now, all of the tablets shipped with mobile data in the U.S. were tied to a carrier. The Google Nexus 7 with WiFi + Mobile Data breaks free of that paradigm, and in so doing literally opens up the world for those on-the-go." Create surveys directly in Web Excel, with results stored inside a table in the workbook. Share your survey with anyone – no Microsoft Account required. Your surveys will always look sleek, modern, and professional. See survey responses added to the workbook in real time. "When the Israel Defense Forces (IDF) this week began taking military action in the Gaza strip against Hamas (as the IDF announced on Twitter), Anonymous declared its own war as part of #OpIsrael. Among the casualties are thousands of email addresses and passwords, hundreds of Israeli Web sites, government-owned as well as privately owned pages, as well as databases belonging to Bank Jerusalem and the Ministry of Foreign Affairs." "The net effect of all this stuff, I think, contributes to a wait-and-see approach with Windows 8. And that is exactly the opposite of what Microsoft and even the broader industry should want at this time. In this way, the Windows 8 launch is much like that of Vista, where a nagging (and in that case, tech blogger-led) cabal of disappointed voices dominated the discussion at launch and torpedoed the product before it had a chance. Windows 8 is no Vista, in many ways. Until it is. All of this was avoidable." With all due respect to Paul Thurrott, I'm not sure it was all avoidable, if PC market saturation, contentment with Windows 7 PCs, and a widespread shift to tablets and smartphones together represent the ultimate Windows 8 challenge. Another potential "culprit" combination: PC market saturation, with most people reasonably satisfied with their current and good-enough Windows 7 (or Mac) PCs, and planning to invest in tablets and/or smartphones as their next computing/communication purchase. A quote from Paul Allen's Idea Man: "Here’s what the death knell for the personal computer will sound like: Mainly I use my phone/pad, but I still use my PC to write long e-mails and documents. Most people aren’t there yet, but that’s where we’re headed. If Microsoft fails to catch up in mobile, in other words, it’s in for a long, slow slide." ""Sales of Windows 8 PCs are well below Microsoft's internal projections and have been described inside the company as disappointing," Paul Thurrott wrote on his Supersite For Windows today, citing a source inside Microsoft. The culprit? "Lackluster PC maker designs and availability," according to Thurrott." "If you want to know just how broken the patent system is, just look at patent D670,713, filed by Apple and approved this week by the United States Patent Office. This design patent, titled, “Display screen or portion thereof with animated graphical user interface,” gives Apple the exclusive rights to the page turn in an e-reader application." Early in 2012, IBM announced rebranding of our service, from LotusLive to IBM SmartCloud for Social Business. This quarter, we are announcing the next phase of the rebranding — changing the service domain itself. From: *.lotuslive.com To: *.collabserv.com"
The wind farm is located in Rippey, a small town in Greene County, about an hour outside of Des Moines, according to a Google blog post. The project was developed by RPM access and is expected to provide power to more than 15,000 homes in the area via the Central Iowa Power Cooperative, a utility. Google operates a data center in Iowa and entered a long-term contract to purchase wind energy from NextEra Energy Resources’ Story County II wind farm in 2010." “The drop in the third quarter is most likely due to the fourth-quarter launch of Windows Phone 8. Windows Phone 7 devices are not upgradeable to Windows Phone 8. The big leap from a year ago comes from Android, which now holds about 72 to 75 percent of the market, up from 53 to 58 percent a year ago, according to the two research firms. "The company has modified its legal agreement with developers working on Android apps to specifically prohibit them from any action that could contribute to further fragmentation of the mobile platform. The anti-fragmentation clause was recently added to the Android SDK licensing terms and conditions, which developers must accept in order to build Android apps." "Speaking in an interview published yesterday with IDG Enterprise, HP PC business chief Todd Bradley said that his company could "hardly call Surface competition," adding that the Microsoft-branded tablet is quite flawed. "One, very limited distribution," Bradley said, listing what he feels are the Surface's greatest flaws. "It tends to be slow and a little kludgey as you use it....It's expensive. Holistically, the press has made a bigger deal out of Surface than what the world has chosen to believe."" "After Israel killed a top military commander of Hamas on Wednesday, Anonymous, the loose affiliation of hackers, retaliated with a series of attacks on Israeli Web sites. In a coordinated action that began at 3 a.m. New York time Thursday, hackers attacked Web sites belonging to the Israel Defense Forces, the prime minister’s office, Israeli banks, airlines and security companies by flooding them with Web traffic, in a campaign they called #OpIsrael." "Bardin’s Waze and other companies are at the forefront of a new trend called data bartering, where companies exchange databases like baseball cards, with no money changing hands. App makers are pursuing all manner of targeted consumer data—from restaurant ratings to store hours—but it’s often expensive to acquire. Data swapping can be a win-win if both sides have complementary proprietary research. “We live in an age where the ability to capture data has never been greater,” says J.P. Rangaswami, the chief scientist for Salesforce.com (CRM). “It’s a commodity now.”"
"What’s the wackiest thing you can imagine Google launching? How about a game to fight for control of the minds of everyone on earth? Or maybe that’s not so wacky. Meet Ingress, a new free mobile app and alternate reality game made by Google launching today (on Android first, available as soon as it makes it through the Google Play release process)." "Launched Wednesday, the new Social Jobs application is a partnership among Facebook, the Department of Labor and several career websites, including Monster.com and the Facebook utility BranchOut. The new app is part of Facebook's Social Jobs Partnership (SJP), launched last year, in which the U.S. Department of Labor, the National Association of Colleges and Employers (NACE), DirectEmployers Association, the National Association of State Workforce Agencies and Facebook joined forces to create a social platform to connect job candidates with jobs." "Advanced search operators are query words or symbols that perform special actions in Gmail search. These operators allow you to find what you're looking for quickly and accurately. They can also be used to set up filters so you can organize your inbox automatically. Some of the most useful operators are listed below. You can also refine your search by clicking the arrow in the search box." "The Israeli Defense Force, the official military arm of the state of Israel, has launched a full-scale combat campaign against Hamas, the Islamist party that governs the Gaza Strip area of the Middle East. But instead of holding an official press conference, as is protocol for events as major as these, the IDF took a different tack. It announced its campaign via Twitter." "This beta also signals the point where Notes and Domino will join IBM's other software products in sporting only the IBM name, which the company feels is a stronger brand than Lotus, according to Brill. The Lotus brand became part of IBM when the company acquired Lotus Development Corporation in 1995." "No, it’s not the Kindle Phone. Not quite. Instead, Verizon will be preloading something called the Amazon App Suite for Android on the HTC DROID DNA, an Android handset that will ship soon. A Verizon leak from September suggested that the wireless carrier would be adding this suite to “all newly launched Android devices.” And while some bloggers misreported this as bloatware—I’d love a Kindle Phone, Amazon, if you’re listening—I think this is a potentially fantastic idea." "But now Sinofsky is suddenly gone. And while I bet his departure will make Microsoft a nicer place to work, I’m not sure that harmony is what the company needs now. Under Ballmer, Microsoft has long operated like it doesn’t care about the future, missing the rise of the iPod, touchscreen smartphones, and modern tablets. Now, thanks to Sinofsky, it’s finally got a chance to break with that sorry past. So he was a jerk. So what? With Sinofsky’s departure, Microsoft is rudderless at a time of intense competition. He was the firm’s most thoughtful executive, certainly more perceptive about technology than Ballmer. Sinofsky had a firm vision about where the PC industry should go. Ballmer does not. As Michael Pusateri quipped on Twitter, “The wrong Steve is leaving Microsoft.”"
"Verizon Wireless recently announced availability of its first Windows Phone 8 devices, the HTC Windows Phone 8X and Nokia Lumia 822, both of which are shipping before the Thanksgiving holiday this year. The 8X and the 822 are priced at $199 and $99, respectively, but Verizon is apparently looking to fill the "free on contract" price point with another Windows Phone 8 device by the end of 2012. Concerning the carrier's Windows Phone 8 lineup, Verizon Wireless CMO Tami Erwin told The Verge that "there will be a $99 and a $199 [option] and ultimately before the end of the year we will have a device that comes in at the free [price] point."" "Android 4.2 offers several benefits over its 4.1 predecessor. People who share a single device among themselves can log in with their own separate accounts. The latest version supports multiple users, so each person can have a unique home screen, background image, and apps." "The company said on Tuesday that in the coming weeks it would release a maps app called Here in Apple’s App Store. It will be a free download for iPhone, iPad and iPod Touch owners. Nokia also said it would release a toolkit for programmers to make Nokia-powered mapping apps for Android phones. And it is forming a partnership with Mozilla, the browser company, to develop location features for its new operating system, called Firefox OS." "The new strategy will put Dropbox in direct conflict with Box, its similarly named competitor that has gone after businesses before pursuing consumers. Dropbox also faces plenty of competition from the various online storage products offered by Apple, Google, Microsoft, and Amazon.com. Microsoft, in particular, has just launched its file-syncing offensive via Windows 8, which rather vigorously encourages people on PCs, tablets, and smartphones to store their files in SkyDrive. Ah, the Switzerland Gambit. Well played, Houston. Well played." "Barnes & Noble’s Nook HD makes up for its ho-hum physical build with a remarkably good screen, and it does a nice job of helping users discover more content. But to play in prime time, it needs more apps that matter and fewer quirks." "I also found some significant downsides to the Yoga. Despite its hefty price, it has limited storage, only fair battery life and lacks a backlit keyboard. In tablet and stand modes, the exposed keyboard is on the bottom, raising the possibility that it could attract moisture or dirt when on a sticky, dusty or wet surface. The keyboard is recessed slightly to mitigate this risk, and it is disabled in these modes. But I still worried about a naked keyboard being the bottom surface of a computer." "The app joins the identical one Google released for Windows 8 in October. And, like that app Google Search for Windows RT offers a bit more than what its name suggests. With the app installed, users are taps away from a variety of Google products, including Gmail, Google Drive, and Google Maps. The app is a veritable Google Trojan horse." Never put anything in an email message, to anyone, that would cause you serious problems if it fell into the wrong hands. That's the plan™. All of it. Never do this. Ever." "They wrote their “intimate messages” as draft e-mails in a shared Gmail account, according to the AP, allowing them to see one anothers’ messages while leaving a much fainter data trail. When messages are sent and received, both accounts record the transmission as well as such metadata as the IP addresses on either end, something the two seemed to be seeking to avoid. The trick has achieved notoriety as a tactic of terrorists who are rightly wary of espionage." "Yammer has historically offered four different options. Microsoft has reduced them to two: a free version called Yammer Basic and a paid version called Yammer Enterprise. Yammer Enterprise, which will be offered with Office 365 Enterprise, will drop from $15 per person per month to $3 per month. Like Salesforce.com and others, Microsoft is talking about unified identity. That’s a fancy way of saying Microsoft will make Yammer, Sharepoint and other tools accessible through a single identity. We heard a bit about this at Build. The idea is to make it possible to log in, use Yammer as an activity stream, Skype for calls, and Office365 to manage documents." "Critically, Sinofsky was not ousted because of any issues with the launch of Windows 8 or the Surface, sources tell us; in fact, it's possible that his departure was already planned, but his ability to execute on Windows 8's retail release was seen as an asset worth keeping him around long enough to see it through. But his attitude (and skill set) as an aggressive, tightly-siloed Windows boss — not a holistic Microsoft boss — may have done him in. Given that the future of Microsoft's ecosystem would require tight collaboration between disparate divisions, Sinofsky's future path as an executive at Microsoft was essentially at an end." "Unfortunately, since then, Google’s Gmail has became the most popular email service in the world, passing Microsoft’s Hotmail (which is now called Outlook.com after a recent rejiggering), according to recent stats from comScore. That has added up to Gmail’s 287.9 million monthly unique visitors worldwide, 286.2 million for Microsoft’s email product and 281.7 million for Yahoo Mail. Still, in the U.S. at least, Yahoo is holding onto its longtime — though dwindling — lead, with 76.7 million using Google’s email product and 35.5 million using Microsoft’s." "In a surprise announcement late Monday, Microsoft said that Mr. Sinofsky, the president of its Windows division, would leave the company immediately after a 23-year career there. His departure was a mutual decision by Mr. Sinofsky and Steven A. Ballmer, Microsoft’s chief executive, according to a person briefed on the situation who was not authorized to speak on the matter." 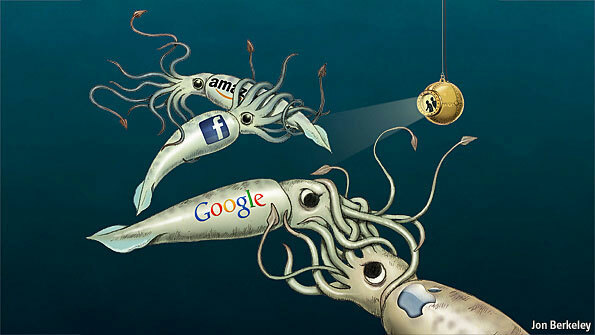 “In the first six months of 2012, Google raked in more ad revenue than U.S. print newspapers and magazines combined. "Though that’s a small dip, the change is noteworthy because for several years, text messaging had been steadily growing in the United States. Mr. Sharma said it was too early to tell whether the decline here would continue, but he noted that Internet-based messaging services, like Facebook messaging and Apple’s iMessage, had been chomping away at SMS usage. He said the decline would become more pronounced as more people buy smartphones. A bit more than 50 percent of cellphone owners here have smartphones." "Perhaps it won’t be long before Google, not Gallup, is the most trusted name in polling." "Yes, at the end of the day (and at the end of the column), only an iPad is an iPad. An Android compact tablet will have completely defined its role in your life after about a month. An iPad, even a small one, continues to find new roles beyond its immediate and obvious functions. That’s what makes it worth the extra cash. The iPad Mini is a smaller iPad . . . but by no means is it a lesser iPad. That’s what makes it such an exciting product." "The relationship might have concluded as so many others do -- temporarily clandestine, permanently concealed -- were it not for the technology that helped to ignite it in the first place. The FBI, the Wall Street Journal reports, began to suspect that Petraeus's personal Gmail account had been hacked -- so it launched an inquiry to determine whether someone else had been accessing his email messages. In the process, the agency discovered what Google's servers had known all along: that the head of the CIA, the keeper of the country's secrets, had been keeping a secret of his own." "Apple may also be playing a bit of “the enemy of the enemy is my friend” here. Though Apple and HTC have hardly been chummy, the company’s biggest strategic battles are against Samsung and Google (which now owns Motorola). By making peace with a struggling HTC, Apple could boost the Taiwanese phone maker in its battle with those two larger rivals." "No longer the province of security services and science-fiction films, biometric technology is on the march. Facebook uses facial-recognition software so its members can automatically put name tags on friends when they upload their photos. Apple uses voice recognition to power Siri. Some theme parks take digital fingerprints to help recognize season pass holders. Now some hospitals and school districts are using palm vein pattern recognition to identify and efficiently manage their patients or students — in effect, turning your palm into an E-ZPass. But consumer advocates say that enterprises are increasingly employing biometric data to improve convenience — and that members of the public are paying for that convenience with their privacy." "The statistician and author of the new book The Signal and the Noise, who has now predicted two presidential elections with astounding accuracy, on the principles he abides by on his blog." "Orca was up against a tough and more seasoned competitor in the Obama campaign's technology and data analysis system. [Romney campaign communications director Gail] Gitcho said that Orca was selected as the name for Romney's data-mining and micro-targeting operation because of the name of Obama campaign's similar operation -- Narwhal, after the whale with a long, straight tusk. "Orca is the only known predator to that," she told NPR. As Election Day played out, it was clear that Obama's Narwhal outsmarted Romney's Orca. " "If you don’t have time to attend the soon-to-be-planned Nate Silver’s Datapalooza, you can still have a crack at becoming the big data star around the office. That’s because the data fiends in Silicon Valley have been hard at work creating software that lets mere mortals run complex information analysis jobs. Some of the best examples of this type of technology can be seen at the Alteryx Analytics Gallery, where you can find ready-made apps for poring over data ranging from census figures to how a merger between two companies may play out." "Mitt Romney’s online voter-turnout operation suffered a meltdown on Election Day, result­ing in a crucial 90-minute “buckling” of the system in Boston and the inability of some campaign workers across the country to use a vital smartphone program, according to campaign officials and volunteers." "First up is more storage. Google has increased the available storage on Cloud SQL from 10GB to 100GB. Reads are now faster since the maximum size of instances has been increased to 16GB RAM, quadrupling the amount of data you can cache. Writes are also now faster, as Google has added asynchronous replication (Google’s way of putting it: “the write performance of a non-replicated database, but the availability of a replicated one”)." "A handful of U.S. Navy SEALS have been reprimanded for leaking military secrets to video-game maker Electronic Arts while working as paid consultants on the game Medal of Honor: Warfighters, according to a report. Seven of the SEALs have been disciplined, including one who was involved in the raid that killed Osama bin Laden, and four others are being investigated, according to CBS News." "Another truly important change was in the technology itself. “Cloud computing barely existed in 2008,” Mr. Slaby said. This time, the Obama campaign’s data center was mainly Amazon Web Services, the leading supplier of cloud services. The campaign’s engineers built about 200 different programs that ran on the Amazon service including Dashboard, the remote calling tool, the campaign Web site, donation processing and data analytics applications. Using mainly open-source software and the Amazon service, the Obama campaign could inexpensively write and tailor its own programs instead of using off-the-shelf commercial software." "Livescribe says the 2GB model offers about 200 hours of audio recording, while the 4GB and 8GB versions offer 400 hours and 800 hours, respectively. The pen’s battery life is estimated at up to five hours with Wi-Fi on, and up to 12 hours with intermittent Wi-Fi use. I’ve been using the pen for the past week with occasional Wi-Fi usage, and have not had to recharge yet. The Livescribe Sky Wi-Fi Smartpen is pricey, but for students and business users who take a lot of notes and want to be thorough, it’s a worthy investment." "But software built for Intel-compatible systems can’t be run on ARM-based systems. How are you fixing that problem? You have to apply the pragmatism filter and say there is all sorts of legacy software out there that’s never going to be ported to a new architecture. Nobody’s going to rewrite Lotus Notes to run on ARM. We don’t believe there’s going to be a massive switch to ARM-based PCs overnight. It’s more of a gradual process as legacy applications become replaced by newer applications that are more up to date. Microsoft’s RT is a good example of that. Successive generations of Windows have been variations on a theme for the last 15-20 years, around the point-and-click-with-a-mouse form factor. They had to do a fundamental redesign if they wanted to be part of tablets. That was an opportunity for people to write new applications that are done in a different way."